Our April meeting will take place on Tuesday, April 16th at 7pm!! Doors open at 6:30 if you would like to come early for some pre-meeting sew-cializing! April Programming: Bring the quart sized bag full of scraps for the challenge. These bags will be swapped around to other participating members. Projects will be due at the July meeting. Use provided scraps + 1 solid of your choice to create anything, anything at all. A pillow, a zippy bag, potholders, a full quilt. Anything at all. We’ll pass out Chelsea’s awesome booklet, and show some great examples. Discuss (as a group) different ways to manage your scraps. May Programming: Scrap cutting party!! 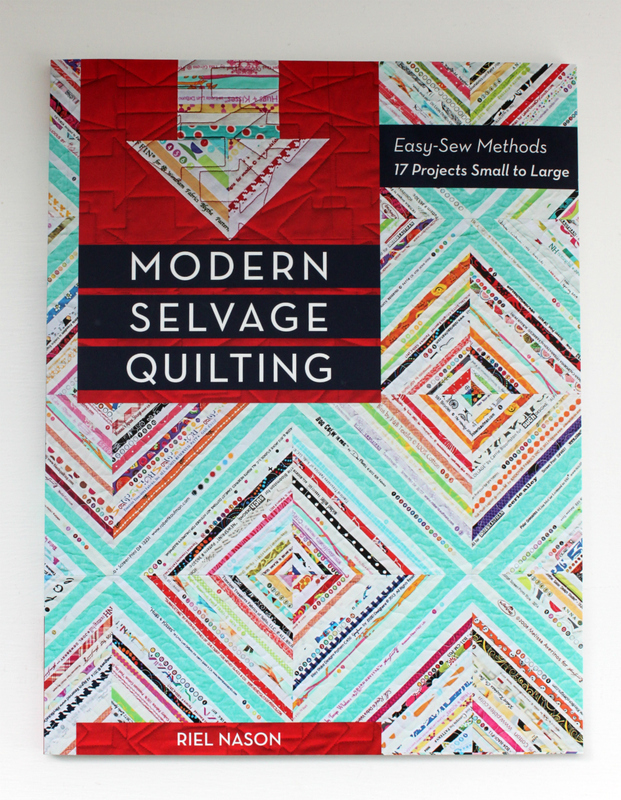 If you’re like me, your scraps are in a jumbled heap and need some serious attention. Usually, that attention involves cutting to precut sizes - so let’s make a party out of it. Or you can just hang out and chit chat, or cut for another project. Show and Tell: Make sure to bring your finishes for show and tell this month. Remember, each item you bring to show and tell in 2019 enters you into a special year-end raffle. Don't forget those WIPs too! We'll be pulling the winners (you heard that right, WINNERS!!!) at our May meeting. Giveaways and Raffles: Our giveaway item this month is Three charm packs of Robert Kaufman's Valley of the Kings. We'll see you tomorrow at the First Baptist Church! Everyone has been busy during the cold weather, and several members were preparing for QuiltCon in Nashville! and pillow in same blue colorway! Betsy finished her Gypsy Wife quilt with her daughter -- it is absolutely gorgeous and very colorful! Alison done at retreat. Ophelia did quilting and also help from Leslie. Lorie made up this quilt from donated fabric for a charity quilt. Pattern from Moda Bake Shop and blew up the sizing. Lorie had a second quilt fully bound she had shown before. Sarah did the quilting and Leslie bound it. Will be raffled off for ABLE NH. Ophelia started with the backing and then designed the front. She did two and quilted both in sequence, and are donated to charity. Great colors and design! Carolyn showed us a very modern and colorful quilt oriented to a toddler. So cute! Carolyn also showed us a tote bag she made! Patti finished a super cute Range back-pack (pattern by Noodlehead) to take to Nashville QuiltCon! Patti also showed us a jellyroll based WIP. Suzie showed off the mini-quilt swap she made for QuiltCon -- the theme is pretty obvious! Suzie made up a pattern designed by fellow guild member Marie, called Nordic Sweater. This is Marie's mini-swap quilt for Quilt Con. Pretty colors. Chelsea showed us a beautiful scrap quilt. Chelsea also showed a super large cross quilt. Sarah had several quilts. This is a baby quilt for a friend, and made a second for the other kid. All out of scraps. Briana showed a quilt she started at the last retreat. Rene shared with us the mini-quilt with nice bright colors she received from her partner in Sweden. The binding is "X"d down by hand with an ombre thread. 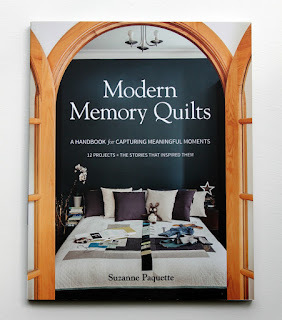 René also showed a quilt she made from a kit. Each block has 103 pieces! Wow! She also practiced her free motion quilting. She donated it to charity. Simone announced she is going to be a grandmother! Gail showed her trial run mini-swap quilt using Alison Glass's Meridian pattern using Alison Glass fabrics. This is Gail's actual mini-quilt for her swap mate in Mississippi. The theme was Mississippi Blues using the Alison Glass handcrafted fabric. This is the back where Gail tried out reverse machine applique using Anna Maria Horner's method. Our March meeting will take place on Tuesday March 19th at 7pm!! Doors open at 6:30 if you would like to come early for some pre-meeting sew-cializing! Programming: Our programming this month is a very special guest, Mary Gregory (aka, See Mary Quilt)! Spring 2019 Retreat: Our Spring Retreat to Kennebunkport will take place May 2nd through May 5th at the Franciscan Guest House. Your last chance to sign-up will be at our March meeting with cash or a check or PayPal sign-ups are available here. Shop Hop: The winner of Shop Hop gift certificate is Rene! 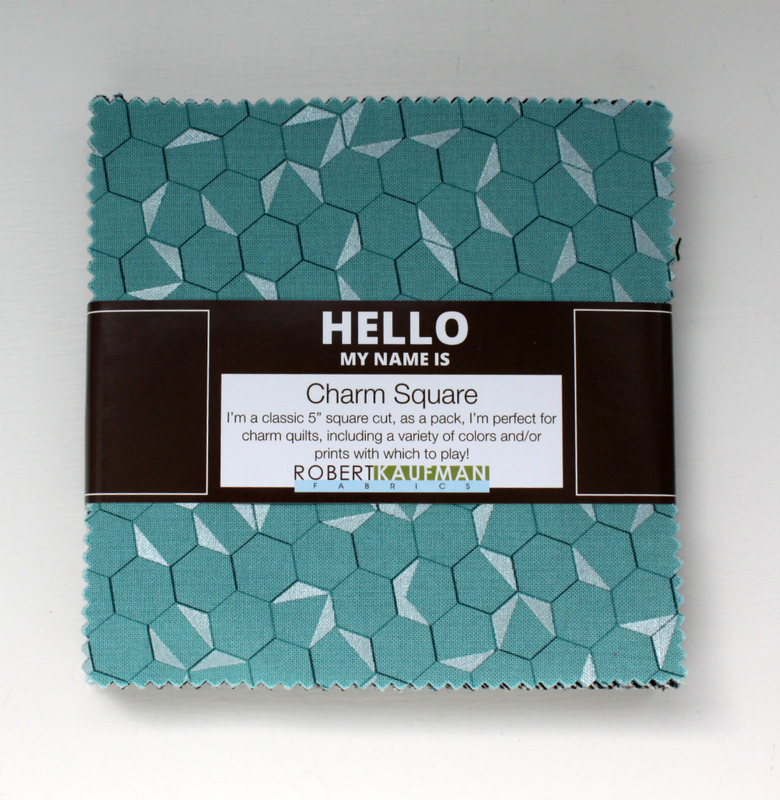 Giveaways and Raffles: Our giveaway item this month is a Shimmer On charm pack by Jennifer Sampou. Our February meeting will take place on Tuesday February 19th at 7pm!! Doors open at 6:30 if you would like to come early for some pre-meeting sew-cializing! Programming: Our programming this month is our 3rd annual yard sale! Details about items we'll be accepting can be found here. People who visit our February meeting will also be able to shop so let your non-member quilty friends know!. 2019 Dues: Your 2019 guild dues are due ASAP. Our dues for 2019 will be $55. You can pay via PayPal on our membership page or with Cash or a Check at the meeting. Spring 2019 Retreat: Our Spring Retreat to Kennebunkport will take place May 2nd through May 5th at the Franciscan Guest House. You can sign-up at the February meeting with cash or a check and PayPal sign-ups are available here. Timna Tarr Workshop: You asked and she's coming back! After hosting a successful workshop with Timna Tarr in 2016 we'll be bringing her back on March 9th for a full day mapmaking workshop. Pricing is $100 for members. You can sign-up via PayPal on our events page or with Cash or a Check at the meeting. The workshop is also now open to non-members. Shop Hop: If you still have it, please bring your "passports" from the shop hops to the meeting and give them to Carolanne. She'll be making up tickets for each stamp you have and we'll have a drawing for a gift certificate. The gift certificate will be to a local shop of the winners choosing. February is the last meeting where you can bring your passport, the drawing will be held before the March meeting. Giveaways and Raffles: Our giveaway item this month is wrist pin cushion. 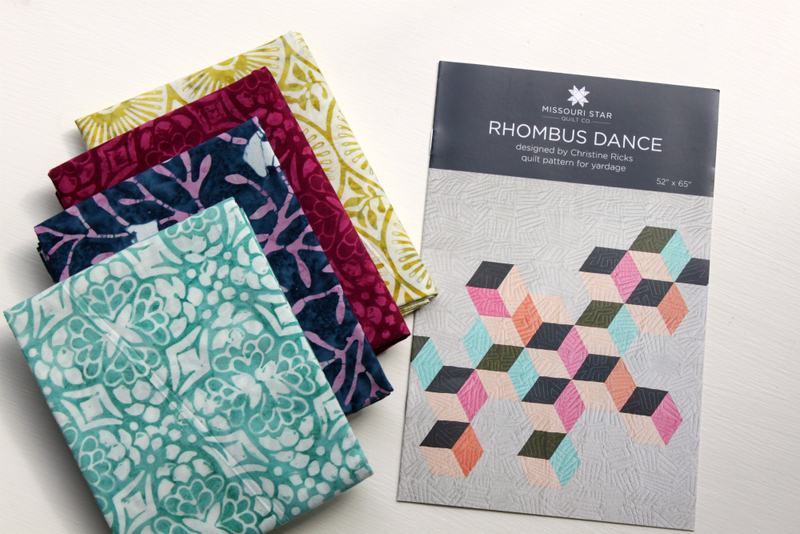 Feeling inspired to free motion quilt after our programming last month? This book is for you! Denyce showed us two versions of pineapple quilts. This one is very patriotic and fun! The version below had many more pieces per pineapple but is also really cute. Mary Jane made this quilt with penguins up for a birthday - super cute! Faces did have a lot of pieces. 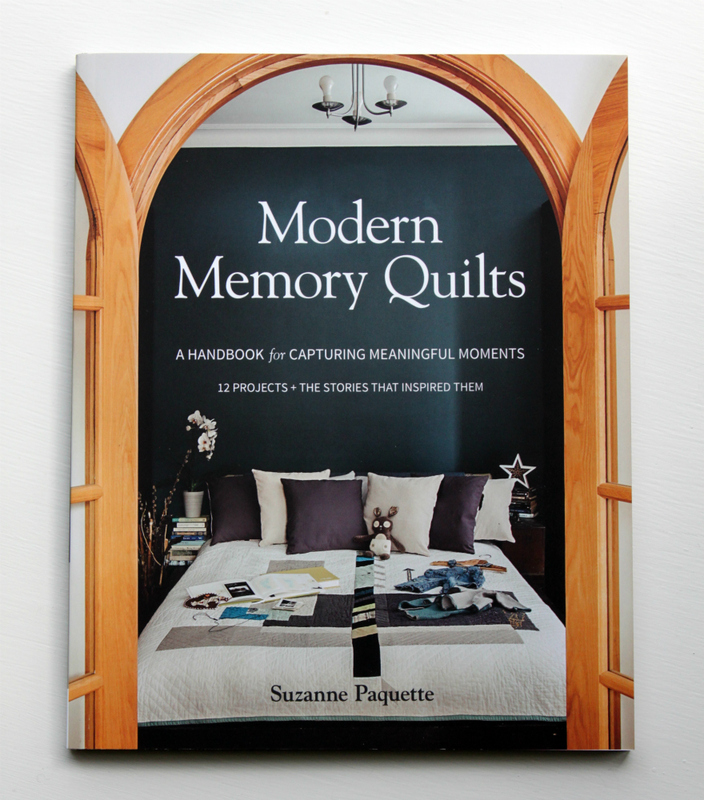 Suzie is back with another layered soft, warm quilt! Unfortunately, the photo of Suzie's backpack is not very sharp. Noodlehead design with cork on the bottom. Super nice! Marie made this stunning quilt for her son's wedding. He returned it to her so she can put a sleeve on to hang it! Chelsea showed us two quilts. This finish has colorful strips. The second granny square quilt is using fabric from Trish's scraps, although the pattern was based on jelly roll fabric. Here is a Moda pattern for a granny square using jelly roll fabric. Sarah showed us her colorful Christmas stockings! Alison showed us the cutest Christmas cat! Pattern called Bah-Humbug! We also heard about her new adopted cat! Patti brought the pattern for a fabric tray -- "Zip Up Tray Pouch" by Aneela Hoey. Laurie showed a nice purple tote bag with hand sewn hexagons and dresdens on the side. Very cute! René had a number of finishes to show us. She started off by showing us her Quilt-Con mini-quilt that she will be swapping with another Modern Quilt Guild member in Sweden. She aimed toward a Danish modern aesthetic. Very lovely with Japanese fans in the middle. Next was a snowman quilt started 17 years ago. 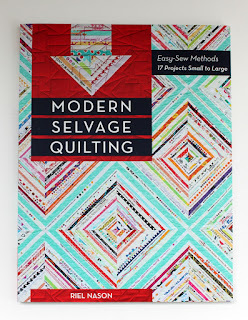 She practiced free motion quilting with a ruler to bring this to a finish. This one was from a kit that René put together at a recent retreat. Did a Greek key quilting on it with backings pulled from her stash. The next one is 12 years old, and René did more traditional ruler work on it. Used "line-tamer" ruler for straight-line and generously contributed it to our charity quilt collection. Next one at least 18 years old. René pieced random squares, and then used wavy lines with a wavy ruler. Very nice! Another donation to charity. This one is 2018 start, and with Zen Chic pattern using the same ruler. Gorgeous! Finally, René showed her back-pack she made with Suzie (same Noodlehead pattern). Plans to use at Quilt Con! Pat showed a place mat she did with a Christmas theme. Carolanne making a jelly roll rug, and showing the ball of fabric ready to be sown into the rug. 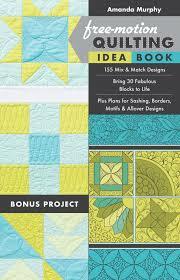 Carolanne showed Kona Splash patterned quilt using color of the year. Was very quick to put together. Great colors! Then there are two extra blocks for pillowcases. Last but not least, this is the Quilters Planner block of the month for last year that Carolanne finished up the top for! 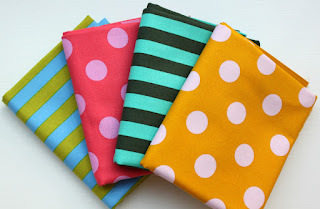 More pretty colors with Alison Glass fabrics and some solids!